Open to new registrations until April 15. 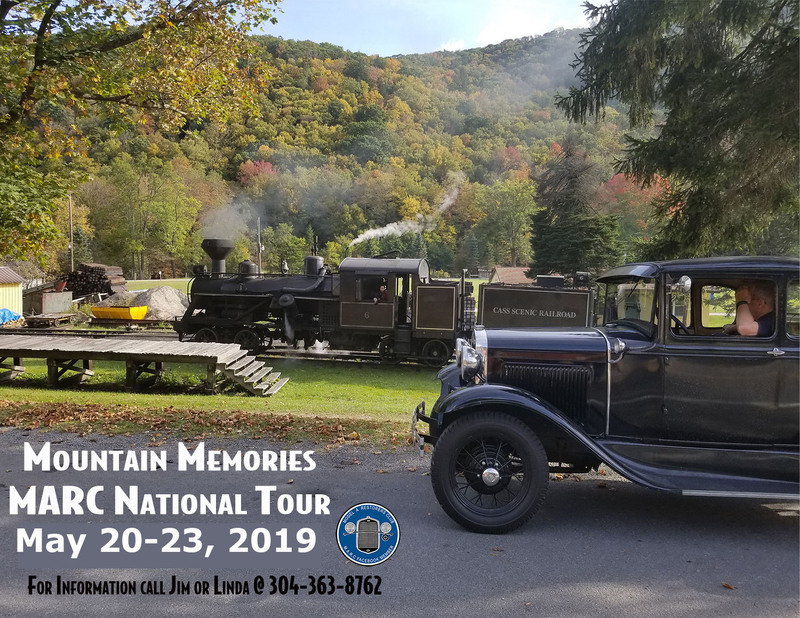 Bring your Model A and family to this historic town in north central West Virgina filled with history, charm and beautiful countryside. Come make your “Mountain Memories” here with your other family in “Almost Heaven”, “Wild and Wonderful” Elkins, West Virginia. If you were registered for the September 2018 Tour, you are registered for the same events for the May Tour. New registrations will not be taken until March 1 in order to give those currently registered the time to book hotel rooms and make any schedule adjustments necessary. As the new date approaches, information will be available in the Model A News, the MARC website and on Facebook to assist those who, because of the rescheduling, would like to sign up for the event. So… stay tuned! We want to thank all registrants for their understanding and patience during our efforts to re-schedule the Tour, and we look forward to seeing you in Elkins in May 2019! Expect to have a 6% state tax and a 6% Occupancy tax added to all of these rates. Everyone must make their reservations by April 1 to receive these rates.